Size 80mm Diameter x 30mm Height. Weight 0.06Kg. This pot is painted in colour K006. It resembles Antique White. Size 75mm Diameter x 60mm Height. Weight 0.07Kg. 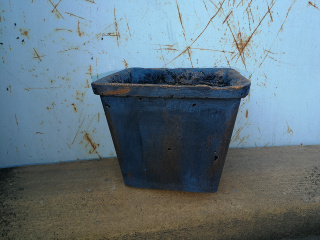 This pot is painted in colour K007. It resembles Old Clay. Size 120mm x 120mm x 120mm. Weight 0.7Kg. This pot is painted in colour K003. It resembles Marble. Size 130mm Diameter x 110mm Height. Weight 0.5Kg. This pot is painted in colour K007. It resembles Old Clay. Size 110mm x 110mm x 100mm. Weight 0.6Kg. This pot is painted in colour K004. It resembles Old Copper.